Most of us know a Bing cherry when we see it, but the cherry Chelan variety is actually ripe and ready almost two weeks earlier and has a similar appearance and just as much flavor. 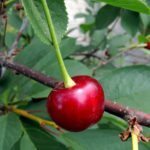 What are Chelan cherries? They are the earliest cherry out of Washington, produce less double fruit and resist cracking. 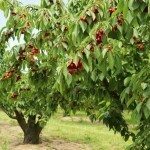 Continue reading for more Chelan cherry tree info, including how to grow these delicious fruits. It is always hard to wait for cherry season. Those juicy, sweet fruits burst with flavor either fresh or in pies and other preparations. Cherries are big business and much money has been expended to find resistant varieties, improve characteristics, and even hasten the harvest season. The cherry Chelan variety is the result of trials through Washington State University at the Prosser Research and Extension Center. The Chelan cherry produces deep, mahogany red, heart-shaped fruits, much like Bing. The medium sized fruit is sweet and runs between 16 and 18 % sugar. Unlike Bing, this cherry tree resists heat induced double spur formation (buttoning) and rain caused fruit cracking. It is a prolific bloomer and often needs management to reduce fruit load. This variety is hardy to United States Department of Agriculture zone 5. The tree is very vigorous, has an upright form and is resistant to several important diseases of cherry. In the 1990s, many of the Chelan cherry trees were infected with prune dwarf virus. Modern trees are grafted on certified disease-free wood. Mazzard is the current rootstock used for Chelan. Like all cherries, Chelan needs a pollinating partner. Ideal selections are Index, Rainier, Lapins, Sweetheart and Bing, but Tieton is incompatible. Young trees benefit from staking and training to enhance the form and develop a strong scaffold of branches. Select a site in full sun with well-draining soil and protection from frost pockets and hard winds. Prior to planting, acclimate the plant for a week in a shady spot. Water the plant consistently during this time. Dig a hole twice as deep and wide as the roots. Make sure all air pockets are out of the soil around the root mass. Water the tree in well. Once trees are 4 to 5 years of age and begin bearing, fertilize annually in spring with a 5-10-10. Cherry trees are low nutrient users but do need consistent water. Most pesticides are applied during the growing season; however, horticultural oils for overwintering insects and larvae should be applied in the dormant season through the growing season. Disease preventative sprays are generally applied at bud break. With annual light pruning, good irrigation, light food and on the spot pest and disease management, Chelan cherries will be in your sights in no time.